A cellophane bee at the entrance to its small anthill-like burrow. In early spring we’re reminded that the ground beneath our feet is home and shelter to many creatures, as they emerge from underground to carry on with their lives. They range from chipmunks, woodchucks, and skunks to earthworms, salamanders, snakes, and frogs, as well as various native bees. One of the earliest native bees to appear is a kind of cellophane bee. The curious name cellophane bee, or unequal cellophane bee (Colletes inaequalis) in this case, might lead you to expect some kind of strange, transparent-looking bee, but no. This bee looks pretty much like most of us would expect from our familiarity with the more well-known but non-native honeybee (Apis mellifera). Cellophane bees are about the size and shape of honeybees. Cellophane bees nest in the ground and are named for the clear polyester substance that they use to make a protective lining for their underground chambers. Such bees are also called polyester bees. As soon as the ground thaws, cellophane bees start to emerge from underground, males first, followed by the females. They’re this year’s generation of cellophane bees and have matured underground throughout late summer, fall, and winter. 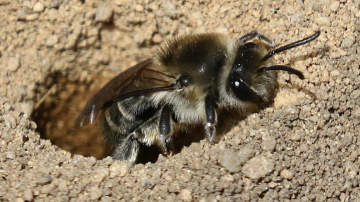 They dig themselves out and immediately get right to work searching for mates (in the case of males) and digging new burrows for their own eggs and offspring (in the case of females). How do you find them? Cellophane bees are solitary bees, so they don’t live and work together in a hive the way honeybees do, but many individual bees often make their underground nests near one another in the same suitable area. Look for the entrance holes to their burrows in sunny, sandy areas with only a sparse cover of vegetation. Such places might be next to a sidewalk or trail, in a field, in your yard, or in a golf course. The bees especially like sunny, south-facing slopes. Look for little piles of earth that are somewhat like small anthills, except that the entrance hole is bigger – about the size of a pencil or your little finger. You might spot a bee – probably a female – peering out of the entrance. You might also see a number of bees flying over the area, low to the ground. Some of these are males looking for females. Do they sting? The females are capable of stinging, but they are not aggressive and generally won’t sting unless you pick one up or sit on it. They’re hard to distract from their urgent business of nesting and reproducing. The males don’t have stingers. So what about that polyester? Each female digs her own burrow. It consists of a main tunnel that goes almost straight down for 1-1/2 to 2 feet, with 1 to 7 side tunnels. Each side tunnel ends in a chamber or cell that the female lines with polyester before she lays an egg and leaves it with a food supply of pollen and nectar. It takes the female about one night to dig a cell and line it with a polyester substance made by a gland in her abdomen. She uses her tongue, which is broad (for a bee) and fringed, to apply a couple of layers of the polyester to the walls of the cell, where the polyester hardens as it dries but remains flexible. The next day she brings in a food supply, lays an egg, and seals the cell with more polyester. What’s the point of the polyester lining? Basically it forms a small plastic bag that protects the food supply, the egg, and later the immature bee. It keeps out moisture, mold and other fungi, bacteria, and even plant rootlets that might grow into the cell. The polyester is biodegradable, but it takes at least five years to break down, so the cell’s precious contents are safe for the year it takes for a new bee to develop. Presumably the new bee chews and then digs its way out. What do cellophane bees find to eat when they emerge so early in the spring? In their earliest weeks, most get nectar and pollen from the earliest-blooming trees, especially red maples (Acer rubrum). As spring progresses, more trees (such as willows), shrubs (such as blueberry), and other plants come into flower. These bees may feed on up to 38 different plants, helping to pollinate them in the process. What should you do if you find cellophane bees? The best thing is to let them go about their short lives in peace. They’re only active for a month or two. Then they’ll be gone without a trace. The adults die off, and next year’s cellophane bees will develop safely, unseen, in their underground plastic bags. If you must discourage cellophane bees from nesting in a certain area, try spreading water over the area, rather than resorting to pesticides, which may be harmful to people as well as the environment. These days we’re apt to hear about the value of native bees as pollinators. Cellophane bees (Colletes) – about 100 species in North America – are just some of many kinds of native bees that live in our environment and pollinate plants. Let’s appreciate them as best we can. If you ever wonder where the notion of “Mother Earth” might have come from, think about these bees and the role of the earth in their lives.